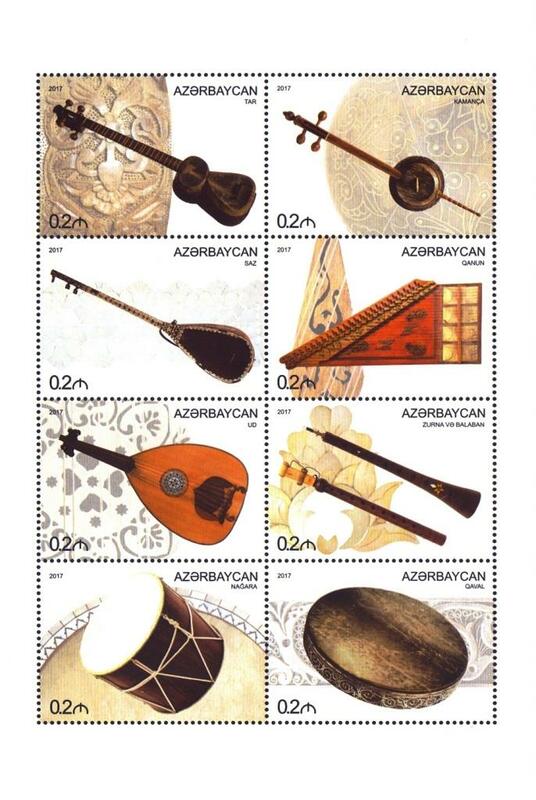 Azerbaijan postage stamps. 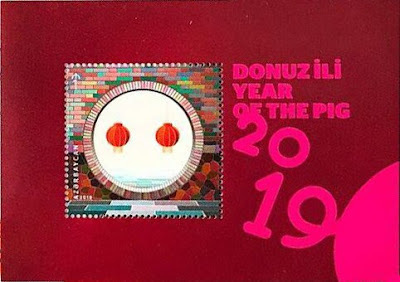 2019 Year of the Pig. 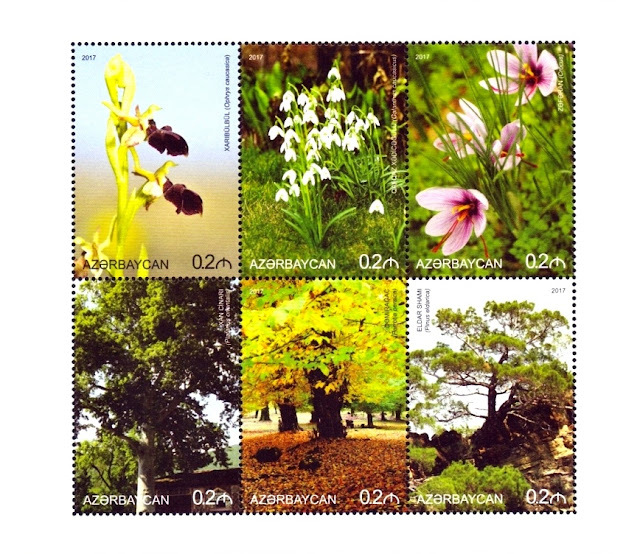 Azerbaijan stamp 2019. The postage stamps dedicated to 95th birthday anniversary of Azerbaijan’s National Leader Heydar Aliyev.The postage stamps dedicated to 95th birthday anniversary of Azerbaijan’s National Leader Heydar Aliyev was issued by Azermarka company in 2018. 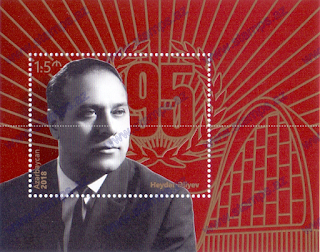 Portaits of the Heydar ALiyev and his wife Zarifa Aliyeva was used as a main theme pictures at the series of two blocks of the postage stamps. For both postage stamps relevant First Days Covers (FDC) also was issued. Mail - Telegraph - Telephone (Baku-Azerbaijan). Mail - Telegraph - Telephone (Baku).In 1818 the first post office was opened in Elizavetpol (Ganja), and post offices in Baku and other provinces of Azerbaijan began to work thereafter. In 1868, the Siemens company commissioned the Tbilisi-Baku telegraph line. In 1879, the Transcaspian region was added to the telegraph network of Russia. To do this, a submarine cable was laid from Baku to Krasnovodsk on the eastern shore of the Caspian Sea. Azerbaijan theme on the stamps of the countries of the world. Hosrov and Shirin love legend. 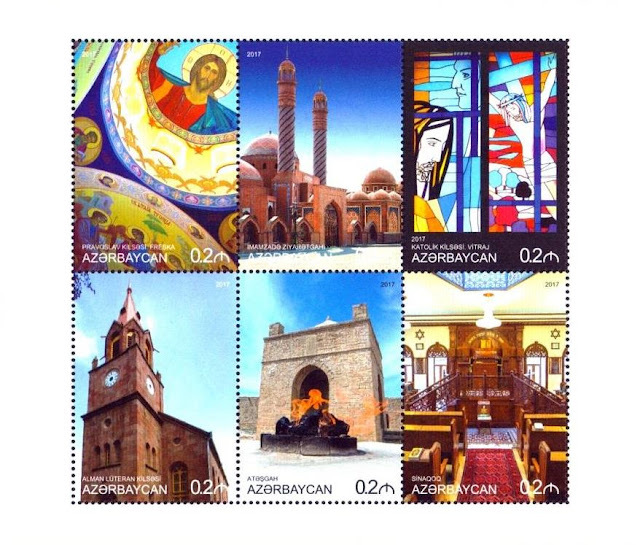 Azerbaijan theme on the stamps of the countries of the world. 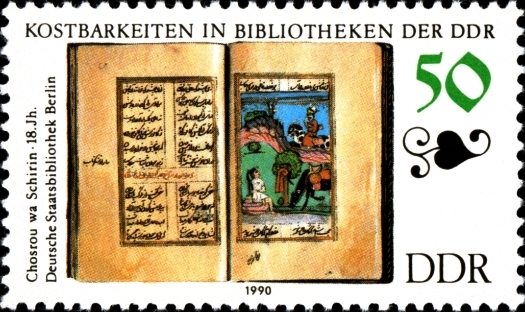 Hosrov and Shirin love legend.Treasures of the German Library.The stamp depicts the eighteenth-century Azerbaijani manuscript "Khosrov and Shirin" from the State Library of the Federal Republic of Germany in Berlin (the former GDR). "Khosrov and Shirin" is the second poem of the classic of Persian and Azerbaijani poetry by Nizami Ganjavi from his collection "Khamsa", written from 1175/76 to 1191. The poem tells about the love of the Sasanian Shah Khosrov, who ruled Iran and the surrounding territories from 591 to 628, to Princess Shirin. Series: Treasures of the GDR libraries. New Azerbaijan postage stamps 2018. 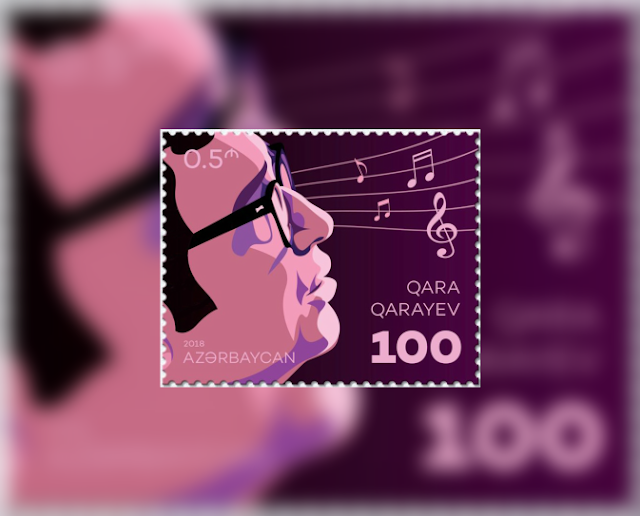 100th anniversary of the birth of Qara QarayevThanks to the assistance of the leadership of Azemarka in providing the picture, we are pleased to present to your attention a new postal stamp which will be issued in current year (2018) in honor of the 100th anniversary of the great composer Gara Garayev. The postage stamp will be issued in 100,000 copies. Dimensions of the brand 28x40 mm. from WikipediA Gara Abulfaz oghlu Garayev was a prominent Soviet Azerbaijani composer. Garayev wrote nearly 110 musical pieces, including ballets, operas, symphonic and chamber pieces, solos for piano, cantatas, songs, and marches, and rose to prominence not only in Azerbaijan SSR but also in the rest of the Soviet Union and worldwide.